A man will likely have to have his arms amputated after injecting chemicals into them in order to get them up to a massive 27 inches. A Russian bodybuilder will almost certainly lose both of his arms after injecting them with chemicals to make them incredibly huge, experts say. 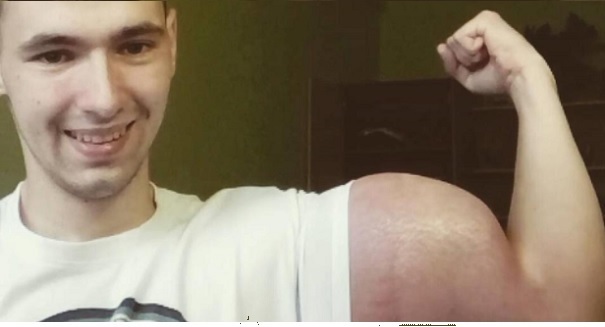 Kirill Tereshin, 21, of Pyatigorsk formerly served in the military and became a viral hit after sharing a video of his grotesquely swollen biceps, and despite the medical problems, he says he’s not going to stop doing it. The video, which is embedded at the bottom of this article, shows his massive biceps at around 24 inches but showing clear signs of problems. Tereshin has been injected a chemical called synthol, made up of mostly oil as well as lidocaine and alcohol, and doctors think it will make him paralyzed or cause his arms to be amputated. He’s earned the nickname “Russian Popeye” because of his huge arms, and despite this concerning development Tereshin says he’s going to keep at it because he enjoys the fame. In fact, he wants to get his biceps up to 27 inches and even star in adult films. Even if he were to stop injecting, which he once used to do up to 10 times per day, the chemicals would remain in his body for years.